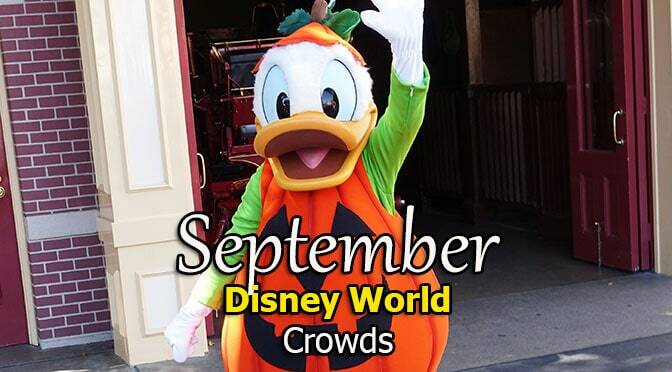 I just completed creating my September 2018 Disney World Crowd Calendar which includes the initial park hours, Extra Magic Hours and some of the nightly entertainment schedules. I continue with my educated guesses on Mickey’s Not So Scary Halloween Parties and possible dates for Night of Joy as well. Check out some thoughts on my September Crowd Calendar here. Disney’s Festival of Fantasy Parade will continue with the 2pm showing that it began back in mid-August. Magic Kingdom will continue with its 6pm closings on potential Mickey’s Not So Scary Halloween Party nights. Disney World tested this last year during Christmas Party season and found it was successful in clearing the crowds from the park prior to the party beginning. Speaking of Halloween Parties, you’ll notice that the Magic Kingdom is marked as “Worst Park” on nights that don’t offer a 6pm closing. Last year I tracked every party and found that the crowds on non-party nights were equal to visiting the park on a day during Spring Break. Even though you might see some days with Light or Very Light crowds, by visiting the Magic Kingdom when it is marked as “Worst Park,” you’ll be facing formidable crowds. If seeing Happlily Ever After is important to you, I recommend using a Park Hopper. Visit a green park during the day and hop into the Magic Kingdom at night for that fireworks show. Halloween Party tickets typically go on sale in May each year, so there is no need to stress over that purchase. The only party that sells out in advance is the Halloween night party. Also a note for this September Crowd Calendar, you’ll find that Star Wars Fireworks aren’t listed. It’s typical that Disney World provides that schedule about 3 to 4 months in advance and I’ll update the schedules. It’s also possible that some nights at Animal Kingdom will see a 2nd Rivers of Light showing. All park hours are initial offerings and they WILL be updated by Disney as we draw closer to your travel dates. You’ll find that Magic Kingdom will close later on many nights, especially on Saturday nights. Epcot never changes their park hours. Visit my Disney World Crowd Calendar page for full details, park hours and Extra Magic Hours for your dates. Do you think/know if Disney will extend park hours for September 2018? Thanks! I think you’re right if you’re planning to stay in a deluxe resort. If you’re staying @ All Stars the rooms do not get discounted often so free dining can be a benefit. I’m booked 9/29-10/5 and it would be $1200 more for the same package without free dining. they offer free dining on no discounted room rates. It usually ends up being cheaper if you take the room discount. The meal plan includes a drink and desert with every meal, so if you don’t typically want that then the room discount is absolutely better. I’ve been many, many times and only did the free dining option just once. Can you explain free dining! This sounds too good to be true. These are initial park hours, they will change. Emh went from 3 to 2 long ago. They do operate shorter overall to save money though. Even though we don’t make it to the Parks as often as I’d like I sure do appreciate your help in figuring out which days are the best or worst. You provide such a wonderful service for all of us. Just wanted to say THANK YOU! I see you have Magic Kingdom closing at 6pm on the 7th/8th for Night of Joy. I thought that it moved to ESPN Wide World of Sports complex last year? Will the park still close early for this event at a different location? Thanks! It says Night of Joy? That means I’m wondering if it will be there. Hours look that way and dates look appropriate. Last year it was ESPN, but wasn’t well attended. Won’t know for quite a while. Thank you. I noticed this is the first year they have had one possibly on labour day Monday. Would this be your pick over Friday? Hi there!! Thanks for doing this!! I was wondering, if we are in Magic Kindgom and are stay for the Halloween party, is it a good time to jump on some rides while they try to clear out the park? Think the lines will be shorter then? Thanks! Park closes 6pm for non-party guests. Some rides will begin having shorter waits around 6pm, but others will take a while to clear. You won’t “jump on” Seven Dwarfs Mine Train, Peter Pan’s Flight or Space Mountain until late in the party. Any predictions for free dining during September? Last year it was available for all of September. It was released in late April.